Outgoing Cal basketball coach Cuonzo Martin spent three seasons in Berkeley, where he put together a middling-to-good run. He won 62 of his 101 games and went 2-4 in three years worth of rivalry games against Stanford. Martin’s greatest accomplishment was recruiting Ivan Rabb and Jaylen Brown to come to the school in 2015, yet all they had to show for that recruiting class was an ignoble first-round NCAA Tournament exit to Hawaii (whoops). Martin coached his final game for the Bears last night, losing to Cal State Bakersfield in the first round of the NIT. The afternoon after that loss, Martin resigned from his post with two years left on his contract, paying Cal $1.1 million to do so. Why would he give up all that coin to leave Berkeley? Martin had a good gig at Cal, but $21 million, seven years of job security, and a chance to move back to Missouri are all perfectly good reasons to go. He’s from St. Louis and he coached at Missouri State before leaving for Tennessee and then Cal. His new deal will put him right at the cusp of the top ten highest paid coaches in the nation. That’s an awful lot of money to pay someone who never won a postseason game at his previous job, but Martin has a ton of upside as a coach because he’s a great recruiter. He got Brown to come all the way across the country to Berkeley and he convinced hometown hero Ivan Rabb to stay put. Missouri is about to get out from under NCAA sanctions; who better to lead the program than a young coach who’s known for bringing in top players? A look at his choice of assistants makes it pretty clear the benefits that he offers. That’d would be Michael Porter Sr., former Mizzou women’s assistant and father of one of the most coveted high school players in a few years, as well as two current Mizzou women’s players. 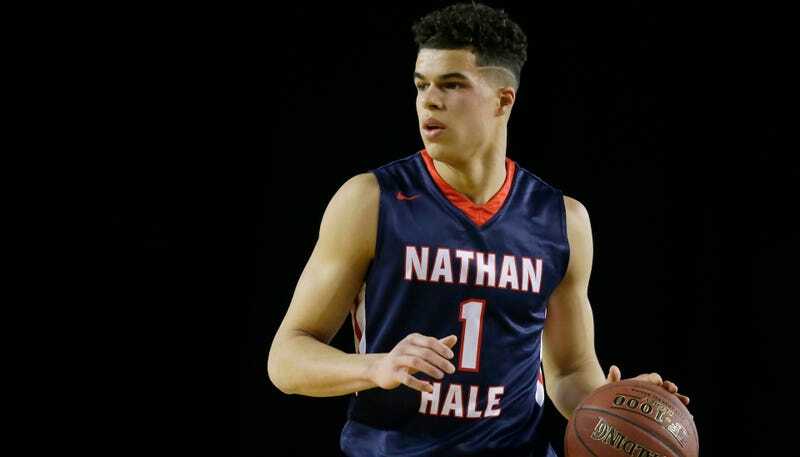 Michael Porter Jr. and his brothers Jontay and Coban went to go play for Brandon Roy at Seattle high school Nathan Hale last year, and Porter Jr. and Jontay are currently committed to the University of Washington. The Huskies had a golden opportunity to land a family worth of top recruits, but Washington also fired their longtime coach Lorenzo Romar this afternoon, throwing a big wrench in their plans to add Porter Jr. next year. Three starters and three recruits are reportedly considering transferring. Both brothers weighed in and don’t seem too happy with UW right now. Mizzou is still paying an exorbitant rate for Martin’s services, but if he can consistently recruit at this level and convert talent to on-court success, it might actually be fair market rate. What Is Jerome Randle Doing Leading The Ukrainian National Team?